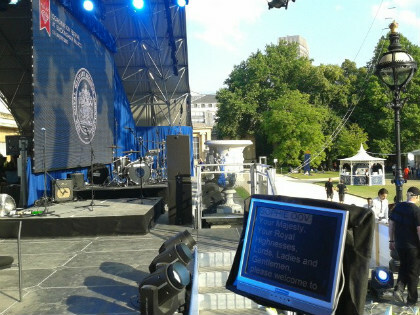 Prompting Plus Ltd provided full script teleprompting services which were used on-stage by performers and the BBC presenter for the Coronation Festival Gala. The event was held in the Gardens of Buckingham Palace to celebrate the 60th anniversary of The Queen’s Coronation. A 50 metre wide stage was constructed in the Palace gardens by Hawthorns to present performances from a wide range of artists. The Gala was organised by Media 10, with full technical production provided by Hawthorns. Because the high profile event was all outdoor, and televised, it presented Prompting Plus with a particular set of problems to overcome. Teleprompting must always be as discreet and unobtrusive to the audience as possible, so to achieve this three script display methods were used at different times and on various areas of the stage. These were a video monitor mounted on a music stand, from the audience viewpoint still just a music stand. Another method was a video monitor mounted in a wedge-speaker style hide, again from an audience viewpoint it was simply another speaker positioned on the front edge of the stage. The third method was a standard conference style glass and stand system, though the glass was a high-reflection prompting mirror specially made for use outdoors, this was then mounted on a programmable electric stand so that the height of the mirror was controlled remotely by the Prompting Plus operator at all times.